Posted on February 27, 2015 by academicbookfuture	in Community Coalition, Wales and tagged Bangor University, Dr Eben Muse, Dr Maggie Parke, Dr Sue Niebrzydowski, National Library of Wales, Professor Astrid Ensslin, Professor Helen Wilcox, Professor Tom Corns, University of Wales Press, Wales. Principal Investigator Dr Sam Rayner has been busy meeting with people and organisations about The Academic Book of the Future. Here she writes about her recent trip to North Wales, and some of the ways that researchers, publishers, students, and libraries in Wales are getting involved with the Project. 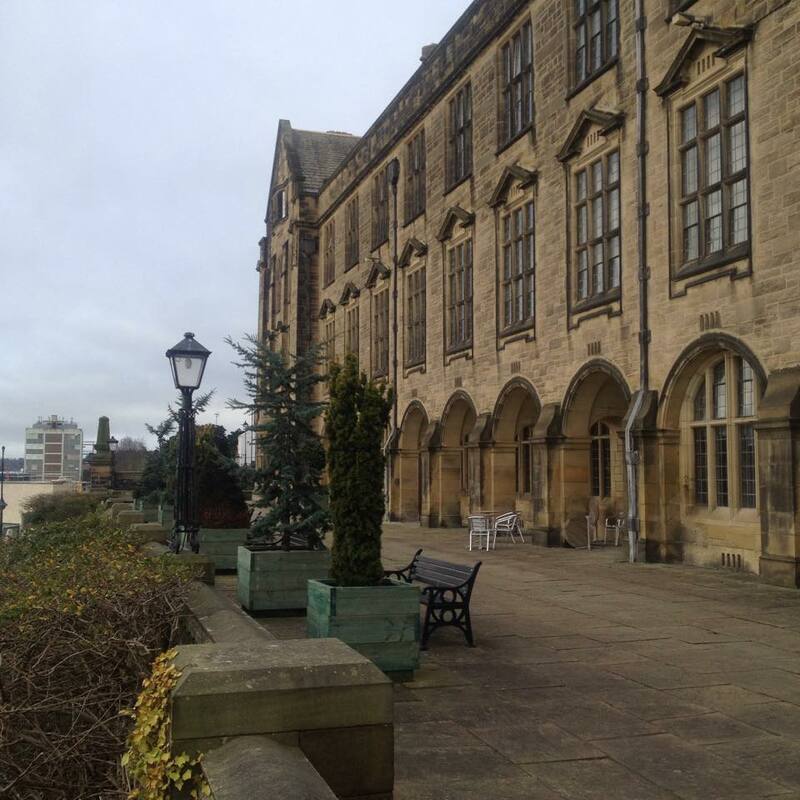 Last week I set off for Project meetings with some of our Welsh partners at Bangor University. Professor Tom Corns from the School of English sits on our Advisory Board, and is keen to see the Project address the challenges around Welsh-medium research outputs, and those on Welsh-focussed topics. I talked with Dr Eben Muse, head of the School for Creative Studies and Media, about the best ways forwards with this, so watch this space for more news on that soon! In addition, given Eben’s interest in bookselling, both new and secondhand, we talked about ways of linking his research on this into our work with the Booksellers Association, and possible connections and events as part of our Academic Book Week in November. We are also planning a summer school/ workshop series on publishing academic books in Wales, so any publishers or editors that might be able to help us with that, please get in touch. While in Bangor, I gave a seminar to some of the MA students in the School of English as part of their Editing Texts module. Convened by Professor Helen Wilcox and Dr Sue Niebrzydowski, this turned into a very lively discussion about some of the issues around copyright and Open Access, linked to the Crossick Report, and the Academic Book of the Future’s aims and plans. Thanks to all for making it such a productive session! Given that the School of English at Bangor has such a rich tradition of scholarly textual editing (Peter Field’s new edition of Malory, Tom Corns’s involvement in the multi-volume edition of Milton’s works, and his edition of Gerrard Winstanley, and Helen Wilcox’s edition of George Herbert are just some of the recent examples), we are looking at holding an event in the Autumn that celebrates this, and the scholarly and publishing expertise that goes into making editions of literary works. Professor Astrid Ensslin is working on another AHRC Project, Reading Digital Fiction with Dr Alice Bell from Sheffield University. There are strong connections between the two projects – both engaging with the nature of the book – as well as Astrid’s expertise in digital narrative more generally, through gaming and language ideaologies. A chance to brainstorm some ideas with Astrid means we have some exciting cross-over activities and events to consolidate in coming weeks. Dr Maggie Parke, whose PhD research used blogging and fansites to help crowdsource the data she used, is going to work with the Project and any interested publishers on looking at ways to help researchers such as herself publish outputs that don’t fit the traditional monograph model. This could be a chance to flip the current publishing proposal model, by getting together some other new types of research and asking publishers to pitch to the researchers how they might best add value to that material. A Dragon’s Den seemed a very appropriate idea to bring away from Wales! I’ve come back to base with plenty of new perspectives for the Project (some I can’t announce yet), and links to connect with the National Library of Wales and the University of Wales Press. If you are part of a Welsh university, or are a Welsh bookseller or publisher who deals in academic books and you have ideas to add into the Welsh part of this Project, please do get in touch with either me (s.rayner@ucl.ac.uk) or Rebecca Lyons, our Project Manager (rebecca.lyons@ucl.ac.uk). Posted on February 19, 2015 by academicbookfuture	in About the project and tagged logo, Rockwell, typeface. Kicking our blog off with its inaugural post, Project Team member Nick Canty considers the typeface used by the Project, how it came about, and what other purposes it has been adopted for since its initial design. The typeface used on our Project logo is called Rockwell. It was designed in 1934 by the in-house studio of the Monotype foundry overseen by Frank Hinman Pierpont, a Connecticut engineer and linotype designer who moved to London. Rockwell is a distinctive version of a geometric slab serif design, which has retained its popularity since its appearance in the 1930s. 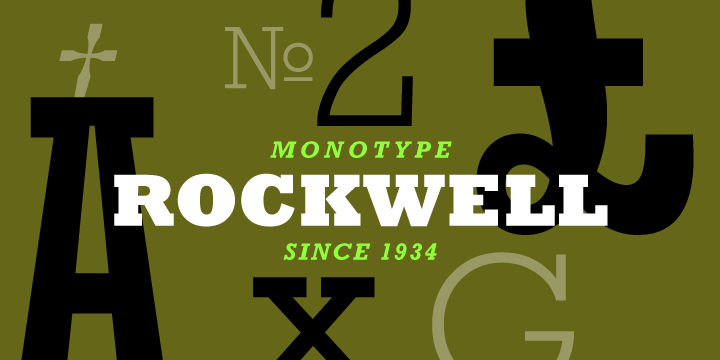 When it was released, Rockwell had several unique characteristics, including differences in spacing, letter weight and subtle changes in glyph formation. The Guinness World Records used Rockwell in some of their early-1990s editions. Informational signage at Expo 86 in Seville made extensive use of the Rockwell typeface and the Docklands Light Railway also used a bold weight of this typeface in the late 1980s and early ’90s. Rockwell is today used by the UK poetry publisher Tall Lighthouse for all their books, as well as on their website. Rockwell is still available through Monotype, now an international corporation with offices throughout the world and with over 18,000 typefaces available.